A Beetle that roars -- with a 351-cubic-inch engine. 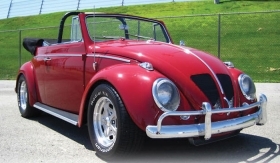 The "Newman Bug" -- Paul Newman's old Volkswagen Beetle convertible -- is up for sale for a cool quarter of a million dollars (about 173,700 euros). Newman bought the red 1963 VW droptop new, and appeared with it in VW commercials. After falling in love with racing while making the movie Winning, he tapped renowned Indy car builder Jerry Eisert to modify the Beetle with a mid-mounted 351-cubic-inch Ford Windsor engine. Eisert also installed a five-speed ZF transmission and suspension parts to keep it stable at high speed. Legend has it that after Eisert finished the car, Newman would cruise Mulholland Drive in Los Angeles, taking on all comers. The actor later donated the hopped-up bug to the Chaffey College auto shop in Alta Loma, California, where more work was done. When Sam Contino, who ran the Chaffey shop, retired, he was given the car as a gift. In 2009, Contino and his son started more work on the car and planned to show Newman the re-refurbished bug. But the actor died before they finished. See more pictures at autonews.com/newmanbug.